Dogs and cats, butterflies and crayfish, lizards and birds, poison ivy and rosebushes and strawberry plants are all organisms. Organisms are composed of organ systems (digestive, circulatory or immune systems, to mention three examples). These systems are in turn composed of organs, which are composed of tissues which are composed of cells. The cell is where the action is! The definition of life usually includes the requirement that whatever lives is capable of viable reproduction, which makes it subject to evolution. All life is composed of cells and they reproduce. 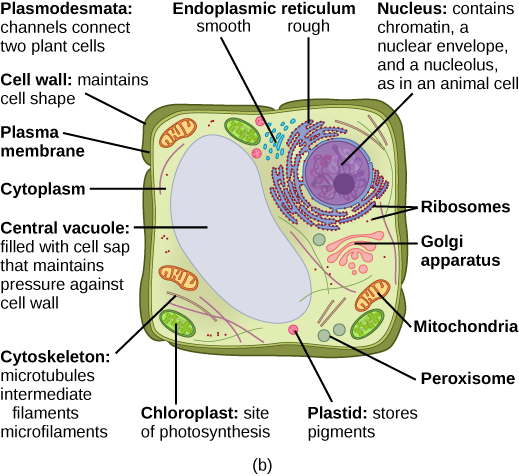 Eukaryotic contain structures called organelles, many of which are not found in prokaryotic cells. One such organelle is the nucleus, which houses the DNA. Prokaryotic cells are usually smaller. They do not contain nuclei, so their DNA is floating around in the cytoplasm. They do contain ribosomes to carry out protein synthesis. Cells come in a huge variety of shapes and functions. They are the basis of all living beings. Whether they are nerve cells, muscle cells, skin cells, bone cells or any other kind of cells; whether they come from humans or cats or grasshoppers or oak trees or bacteria, they all are based on common features like a membrane filled with cytoplasm, DNA or RNA along with ribosomes for reproduction, and the fabrication by cellular respiration of ATP for energy. This fact seems to represent a certain indication of the common origin of all life. As we saw in the discussion of water, lipid bilayers, in this case, phospholipid bilayers, can form membranes. All cells are surrounded and protected by such membranes, also called plasma membranes. The membrane contains various proteins which serve to pass substances across the membrane, to identify it or to fulfill other functions. (More on that shortly.) This view of the cell membrane, as a mosaic of elements, is called the fluid mosaic model. 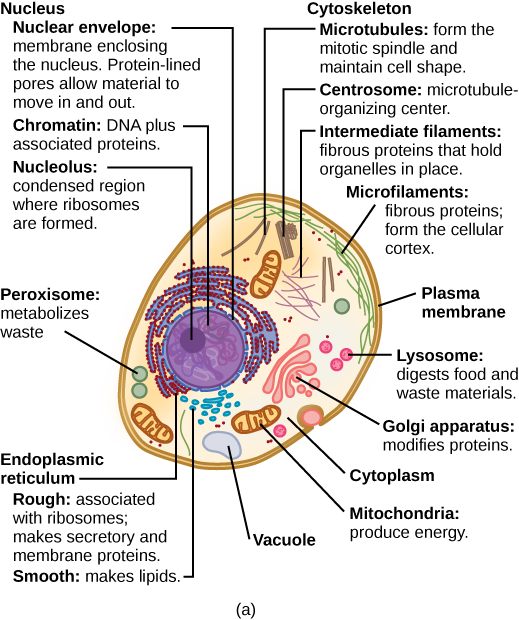 Everything inside the cell except the nucleus is the cytoplasm, including the cytosol, the jelly-like fluid in which other structures float, the organelles, including the nucleus, the mitochondria, and other structures. The membrane is capable of forming pockets called vesicles. They can form on the inside of the cell membrane and surround material, then close and reopen on the outside in order to eject the material stored in them. In the other direction, they may form around external material and carry it into the cell. The nucleus holds the DNA, normally wrapped with other proteins into strings of chromatin. Chromosomes are only constituted when needed to facilitate reproduction. The nucleus is surrounded by its own double membrane. The nucleolus within the nucleus serves to synthesize ribosomes, which in turn are sites for synthesis of proteins. The greater the number of proteins produced by a cell, the larger its nucleolus. Mitochondria are where the final products of digestion, mainly glucose, are converted into ATP, the body’s “energy currency”, which transports energy to whatever metabolic process may need it. 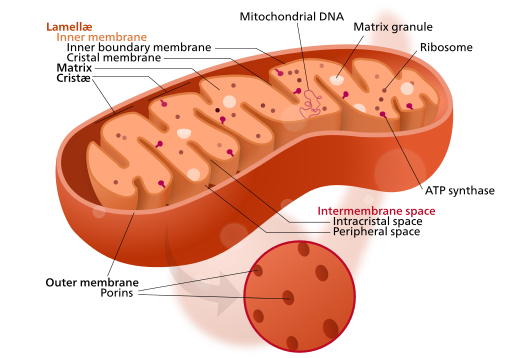 A mitochondrion has both an external and an internal membrane. ATP is produced by processes taking place along the inner membrane. The interior of the mitochondrion is called the matrix. Cellular respiration (energy production) will be discussed in detail in the chapter on anatomy and physiology. According to symbiogenesis, or endosymbiotic theory, mitochondria originally were prokaryotic bacteria which moved into other cells and formed a symbiotic relation with them. Similarly, choroplasts are prokaryotic bacteria which have moved into plant cells. Mitochondria still have their own DNA, independent of that in the cell nucleus, although they have abandoned or given up much of their original DNA. The current model of eukaryotic evolution starts with an anaerobic eukaryote which absorbed an aerobic bacterium which later became a mitochondrion. Subsequently, some of these now aerobic eukaryotes absorbed photosynthetic bacteria, probably cyanobacteria, which became chloroplasts. The latter eukaryotes formed plants, whereas those which did not absorb the photosynthetic bacterium became animals. Ribosomes are where proteins are built following instructions contained in DNA; the instructions are transmitted to the ribosome in the form of messenger RNA, mRNA, about which more later. Ribosomes consist of two subunits, large and small, both of which are constructed in the nucleolus from ribosomal RNA (~75%) and proteins. The endomembrane system has been referred to as the “post office” of the cell, as its components produce, package and export certain cell products, such as proteins or lipids. It has several components. Endoplasmic reticulum — This is actually an extension of the membrane of the nucleus outwards to form folds. The rough ER is studded with ribosomes, to make proteins. The smooth ER is not and produces lipids. Golgi apparatus – This serves to dispatch the various products to their final destinations. Lysosomes – These “garbage-collection” modules contain enzymes which can break down and digest molecules and even cells. In the process of phagocytosis, for example, macrophages, a type of white blood cell and part of the immune system, gobble up pathogens and then deliver them to lysosomes for destruction. They do not exist in plant cells. Peroxisomes – These also contain enzymes for decomposing various molecules by transferring hydrogen to oxygen to produce hydrogen peroxide, H2O2. In the liver, they break down ethanol (alcohol from alcoholic beverages). “Form follows function”, in biology. Cells which produce large amounts of proteins have voluminous endoplasmic reticulums and those which secrete much have large amounts of Golgi bodies. Those, like muscles, which need great amounts of energy contain many mitochondria. Proteins of the cytoskeleton support the cell and give it shape. They are of three varieties. Microtubules are made of the protein tubulum and provide structure, like scaffolding, which allows the cell to resist compression. They also form something like a railroad track for RNA to flow along during protein synthesis, rather than letting it float loose in the cytoplasm. cilia, fine, hair-like structures which wave continuously and move such things as waste in the respiratory system or egg cells in fallopian tubes. Microtubules form the centrioles, the principal part of centrosomes, which play an essential role in chromosome splitting during reproduction (explained later in this chapter). Microtubules and microfilaments are like cables and work with motor proteins which pull themselves along the cable. A family of motor proteins, kinesins, attach to vesicles carrying, for instance, RNA and crawl along the microtubules similarly to the way myosin crawls along actin in muscle cells. Since motor proteins move themselves along the support structure of the cell, they are probably evolved forms of the cytoskeleton of bacteria. [ref]This was only observed in the mid-1990s. Lane (2009), 167. [/ref] Bacteria can be motile in their way too, since they change by adding on elements at one end and leaving them off at the other, effectively moving and generating force. The evolution of motility was an essential step in the spread of plants and – especially – animals some 250-or-more million years ago. Intermediate filaments are made of keratin and serve, like microtubules, for maintaining cell shape, but, contrary to microtubules, they resist tension which tries to pull apart the cells. In addition to the support they receive from the cytoskeleton, many animal cells have an extracellular matrix of connective tissue composed of long proteins like collagen which help support the cell and bind cells together. Plants have cell walls composed of a reinforcing layer of cellulose. Plant cells differ from animal cells in that they have cell walls outside the cell membrane, and contain a central vacuole and chloroplasts. The cell wall is a stiff outer layer which supports and protects the plant. The large central vacuole contains liquid which exerts pressure to maintain the plant’s standing position, just like air in a balloon makes the balloon stiff. The liquid also stores proteins. The chloroplasts are where photosynthesis takes place. Like mitochondria, they contain their own simple form of DNA as well as ribosomes, because, like mitochondria, they originated as bacteria which moved into another cell, felt at home and stayed. The structure of chloroplasts and their use of energy from sunlight to convert CO2 and H2O into sugar will be presented in the next chapter. Viruses are not cells because they do not contain all the good things described above. A virus consists of a protective protein coat called a capsid, which contains the viral DNA or RNA (but not both). It may also be surrounded by an envelope which closely resembles a cell membrane – because the virus has stolen it from a cell and adapted it to its own nefarious ends — a virus in cell’s clothing. Viruses have no ribosomes or other organelles to synthesize proteins, so they are dependent for reproduction on normal cells which they invade, substituting their own genetic material for that of the cell and then letting the cell do the job of protein synthesis – but using the virus’s recipe. Real Trojan horses! 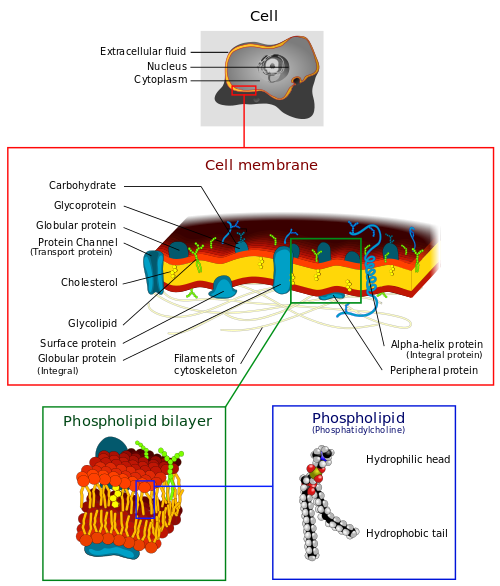 Cells are surrounded by a membrane composed of a phospholipid bilayer arranged in such a way that the membrane surfaces are hydrophilic and the interior hydrophobic. No charged ion, hydrophilic molecule or very large molecule can traverse the membrane. But the cell needs to receive nutriments, expel waste, receive hormonal messages, and so on, so the membrane must not be completely impermeable. In order to allow the necessary passage of chemicals, the cell membrane is studded with proteins which control the passage of such objects. Ion channels are passageways through the cell wall which allow ions to pass naturally in a direction tending to equalize their electrochemical or concentration gradients inside and outside the cell. Such channels may be ion-specific (for instance, allowing only K+ ions to pass), charge-specific (allowing either negative or positive ions, but not both) or size-specific. Some ion channels are leakage channels, opening randomly. Gated ion channels allow ions through the channel on occurrence of some event. This might be the arrival, for instance, of an electric potential (voltage-gated ion channel) or a specific chemical substance (ligand-gated channel). Voltage-gated channels are essential to the formation of action potentials. Ion pumps, especially the sodium-potassium (Na-K) pump and the calcium pump, run all the time in most animal cells, using energy from ATP to pump ions across the membrane against their concentration or electrostatic gradient. The concentration of chemical substances inside and outside the cell generally are not the same and this is crucial to their functioning. It all starts with a pump, the sodium-potassium (Na-K) or ATPase pump. This object is powered by ATP to flip back and forth between two states. In one state, it pumps Na+ ions out of the cell; in the other, it pumps K+ ions into the cell. Soon, a concentration gradient is established for each ion, tending to pull the Na+ back into the cell and to push the K+ out. The pump does more than that, because for every two K+ ion it pulls into the cell, it pushes three Na+ out. The result is the establishment an electrostatic potential across the cell membrane. Because the extra positive charges outside attract any negative charges inside, they tend to be concentrated close to the membrane surfaces, so the membrane forms an electrical capacitance. an electric potential across the membrane due to the greater number of positive ions outside the cell. Note that there are also lots of large anions, such as phosphate or negatively charged proteins, inside the cell. Ion channels for K+ tend to leak K+. The K+ tends to follow its concentration gradient out of the cell, but this leaves behind a more negative interior, which attracts it back toward the interior. 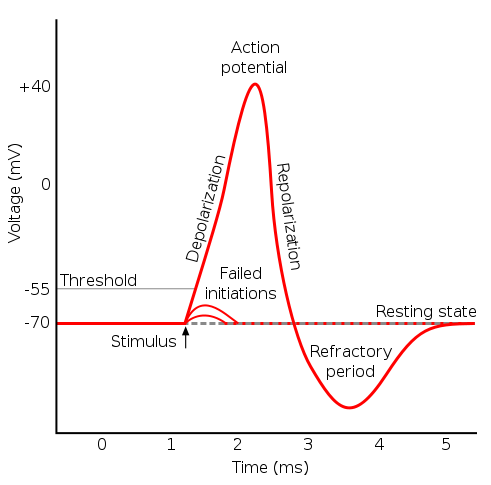 Eventually, an equilibrium state is reached where the outward pressure due to the concentration gradient balances the inward pressure due to the electrostatic gradient. Measurements show that the interior has a potential of -92 mv (relative to the exterior). The cell is said to be polarized. In this state, opening an ion channel would allow positive ions to flow into the cell, depolarizing it. If we start over and do the same thing, but open a Na+ channel, Na+ rushes into the cell, bringing up the cell’s potential until equilibrium is reached between the concentration and electrostatic forces, this time at a potential of +62 mV. So each ion has an equilibrium potential which is a function of the concentration difference across the cell membrane. The membrane potential of the cell as a whole depends on the concentration differences of all the ions inside and outside the cell. A very small change in ionic concentration can bring about a much greater change in membrane potential. Consider a nerve or muscle cell at rest, with a membrane potential of around -70 mV, so the cell is polarized. Suppose something happens which causes the membrane potential to increase (i.e., to become less negative). This could be due to entry of ions through a ligand-gated channel (as in neurons) or a mechanically-gated channel (as in a somatosensory channel) or simply due to K+ leakage (as in a pacemaker cell of the heart). If the increase is small, nothing happens. But if it becomes sufficient to bring the potential up to the threshold value of -55 mV, then a voltage-gated Na+ channel opens, allowing Na+ to come rushing into the cell, quickly raising the potential to a positive value and depolarizing the cell. When the potential reaches 30 mV, the voltage-gated Na+ channels close but voltage-gated K+ channels open and K+ starts rushing out of the cell, bringing the potential back down (positive charges are leaving the cell) and repolarizing it. In muscles, release of the neurotransmitter acetylcholine (ACh) by motor nerves opens ligand-gated channels which allow the cell to depolarize to the threshold for voltage-gated sodium channels, which in turn cause an action potential which eventually opens another channel which allows Ca++ into the cell. The Ca++ binds to troponin in the muscle fiber and unlocks it, so that myosin heads can “walk” along the thin filament and contract the muscle. The heart is special in that it initiates its own action potentials in a repeated, periodic way. The cycle is initiated not by a ligand-gated channel, but mostly by leakage channels which allow some Na+ to enter the heart, gradually raising the membrane potential from about -60 mV to -40 mV. This is the threshold value for a gated channel to open, allowing depolarization of the cell. However, because of the leakage, only slow Na+–Ca++ channels are opened, which explains the relatively slow rise of the potential. After about 100-150 milliseconds, the Na+–Ca++ channels close and K+ channels open. As K+ rushes out of the cell, the potential redescends to a bit under its initial resting value. Then the K+ channels also close and the cycle starts over. So the heart beats all by itself due to the membrane potential of the cardiac muscle cells, the slow leakage of Na+ and the voltage-gated Na+–Ca++ and K+ channels. Continue reading about DNA expression and protein synthesis.